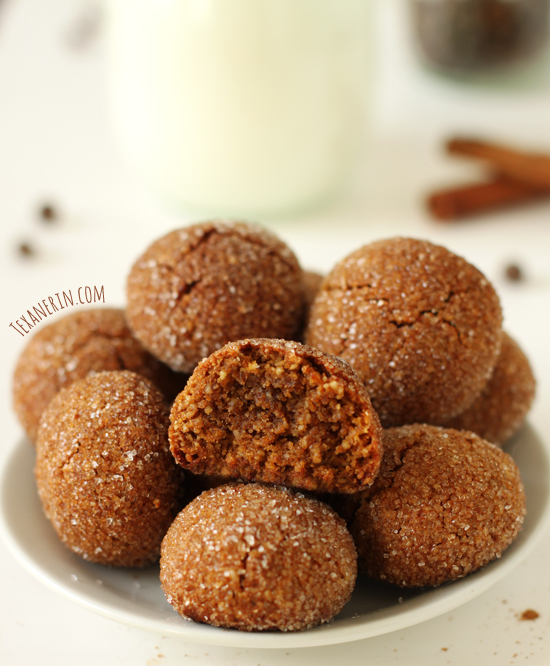 Paleo ginger cookies that are super soft and chewy! Just as delicious, if not better, than a gluten-filled ginger cookie. They’re also grain-free, gluten-free and dairy-free. 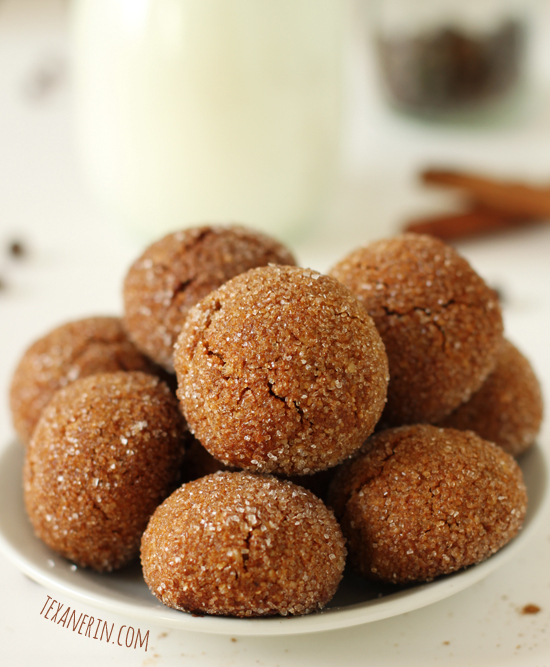 These paleo ginger cookies have the perfect texture! No funky gluten-free weirdness around here. I’ve made them so many times not just because they’re so yummy, but because I keep eating them all before I can take pictures. I used a mixture of almond flour (almond meal would work, too!) and coconut flour. I find that this usually produces a nice chewy texture in cookies. If you don’t happen to have coconut flour, I really suggest buying some. It’s not the cheapest flour but you only use a little bit at a time. I have my $10 container around for months and I bake with coconut flour a lot. But if you don’t want to buy it or are really desperate for ginger cookies, these whole grain ginger cookies are amazing! But honestly, I prefer this grain-free version. I love these ginger cookies plain, which is what you see here, but I’ve made them with crystallized ginger. And chocolate chips! And orange zest. One thing I haven’t tried is white chocolate. I think that would be even yummier than with semi-sweet chocolate! Sometimes grain-free cookies can be slightly sticky but rolling them in sugar solves that issue. Coconut sugar would work fine if you’d like to avoid the white stuff and keep these ginger cookies paleo! If you prefer low-carb cookies, try out this amazing looking Low Carb Keto Cream Cheese Cookies Recipe! Looking for other gluten-free holiday cookies? Mix the dry ingredients (almond flour through nutmeg) in a medium bowl and set aside. In a large bowl, mix together the rest of the ingredients. Add the dry mix to the wet mix and stir, just until combined. It will be like batter at this point. Chill in the refrigerator at least 30 minutes or until it's firm like regular cookie dough. Form the dough into twenty-eight 1 1/2" balls. Roll in additional granulated or raw sugar, if desired, and place on a cookie sheet (I put mine on a Silpat) about 1 1/2" apart. There's no need to flatten them. Bake for 14 minutes. They'll crackle a little (that's good!) and still be soft. Transfer the cookies to a wire rack to cool. 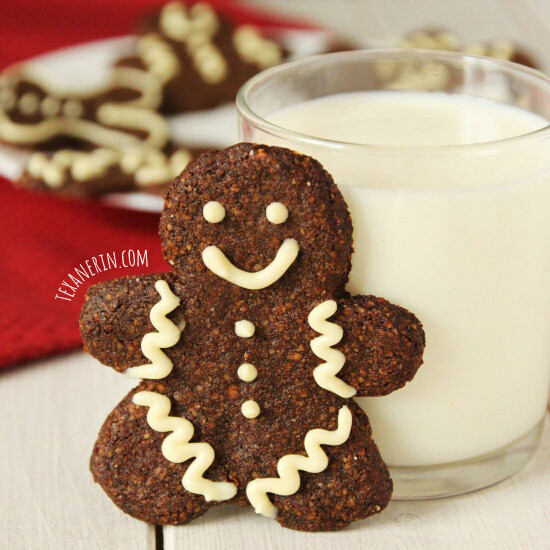 70 comments on “Chewy Paleo Ginger Cookies (grain-free, gluten-free, dairy-free)” — Add one! I happened on your website looking for a gluten free carrot cake recipe. To my delight your GF recipes use almond and coconut flour! I had bought them – but the pancake recipe I tried elsewhere was awful! And the rice in the gluten free flour blend I bought is a little gritty for my liking. Well the cupcakes turned out perfect and delicious! Thank you so much!!! I am so excited to try the ginger cookies tomorrow. These are the kind of recipes I’ve been looking for for gluten free baked goods that taste yummy! These look delish!!! Great pics too. 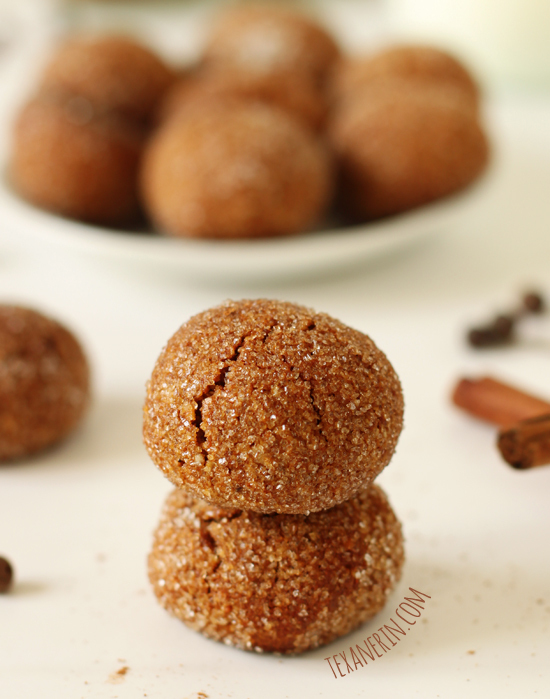 I’m getting ready to publish a low sugar ginger cookie over on my blog, but these look incredible. Have you tried baking with monk fruit or erythritol to lower the sugar? Thank you! I’ve tried making a few of my recipes low-carb by using Sukrin and Swerve but everything came out terribly. :/ Monk fruit I haven’t tried, though! Hi, I’ve made these before and love them. I’d like to make them for a vegan friend. Do you have any suggestions for replacing the egg? Thank you! These were really good! I liked how simple they were to make. The crackly thing…oh how I love those cookie crackles! I rolled them in cane sugar, and then when they cooled I made a glaze with almond milk and powdered sugar and spooned it over them. 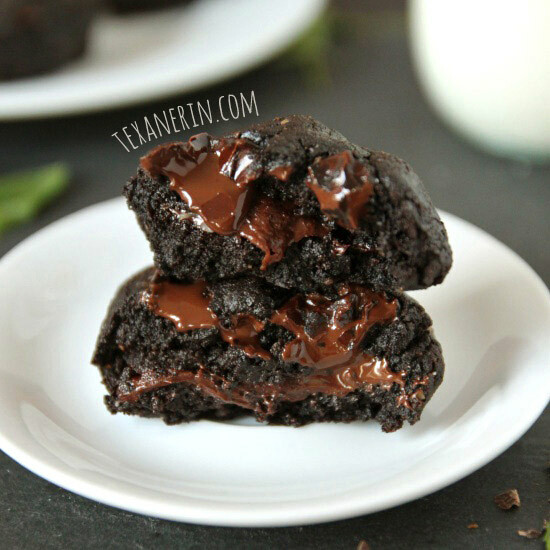 That put them over the top….but they were plenty good without the glaze and perfect for a healthier cookie. I’m so happy you liked them and I love the sound of that glaze! I’ll have to try that next time. :) Thanks a bunch for your feedback and the tip! How should these be stored, and for how long can they be stored? Would like to bake some for Christmas presents. Thanks! Store in an airtight container for up to 4 days. No need to refrigerate. :) I hope they’ll be enjoyed! I made these and they are just wonderful! I added finely chopped pecans for a little extra crunch. And a pinch more ginger. Candied ginger would also be great. I bet the pecans add a nice touch! Thanks for the tip and for your comment. :) So happy that you liked them! These are SO YUMMY! My non-Paleo extended family absolutely loved them…so much so that they were requested for next year AND I am making them again for a party we are having this weekend. Woot woot! Thank you SO much! I am wondering if I could push a white chocolate kiss in middle kind of like a peanut butter kiss cookie? What do you think? Oh my, yes! I haven’t tried it but that sounds amazing. :) Let me know how they come out! Didn’t realize I was out of almond meal, so I subbed more coconut flour (livin on the wild side) and some flaxseed meal. Used all molasses. Let them cool completely and score! Thanks, Barbara! I rolled them in sugar before baking. :) Raw sugar works great and coconut sugar works, too, if you don’t mind the stronger taste (which I do). I hope you’ll enjoy them if you try them out! Just made these cookies this morning. They were fantastic and turned out perfectly. Next time (and there will be a next time!) I think I’ll add a dash of clove for good measure. Thanks! Fresh ginger or ground ginger??? These look soooo yummy! Do you have any idea of the calorie count per cookie (I apologize if this is already posted, I looked quickly but didn’t see any nutritional info in the comments). Your recipes are awesome! I’ve made these three times now and have doubled the last two batches. Hands down my favorite gluten free cookie. The only modification I’ve made is to add a bit of ground flax for the some of the almond flour. Delish! Thanks so much for this fabulous recipe. We made these for my German coworkers and they were impressed, as were we. However, coconut flour is not easy to get here. 13€/kg at our neighborhood Bioladen! Any cheaper near you? Can I sub the coconut oil with a different one? My family doesn’t like coconut as much as I do, and they can taste it. Can’t wait to try some of your other recipes! They all sound awesome! Thank you so much, I’ll take a look. Can’t wait to do my Christmas baking now! Love my sweets, but hate the fat and sugar. Thanks for helping to reduce these and give back the healthy in treats. Aww, I really hope you find out what's causing your problems. I've heard good things about those light therapy lamps actually. Your cookies are so cute! Yum! I hope cutting out gluten makes you feel better. 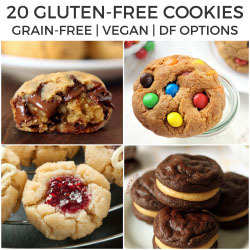 These cookies look great, I should find some coconut flour so I can try more gluten free baking! So excited to have found your blog last night on pinterest! I follow the Paleo Diet so I am constantly looking for grain free recipes. Cookies are my weakness and these look delish! My fiance made a grain free pumpkin "granola" last night. Recipe needs a little tweaking, but I think it will turn out great the next time! Hope you are feeling better soon. I have been struggling with extreme fatigue lately as well, but I am too busy to go to a doctor! Hi Aimee! I'm happy you found me too. :) You'll find lots more grain-free recipes in the future because I really like them and they're fun to make. And they're SO much better than the gluten-free ones with weird flours in them. At least to me! Are these cookies Paleo? I hope they are so that you can make them! 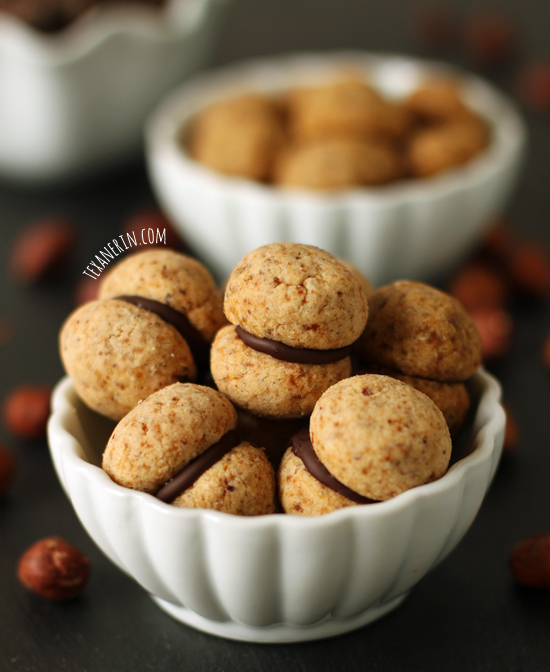 They're really my favorite grain-free goodie so far (I only started in March or so). Your fiance sounds pretty great, making granola and all! I hope you have a chance to go to the doctor soon to find out what's going on with you. Good luck with that. :) Thanks for stopping by to say hi. I love hearing from new readers! Yay! Let me know how they come out. You could reduce the honey by a few tablespoons, but it might affect the texture, which I'd be afraid of messing with. I love these so much that I'll be making them again and I'll experiment and add a note about the honey. I have constant fatigue as well. Maybe I should join you in this gluten free month long experiment. If any of the recipes are like these cookies, I am totally in! Oh, sorry to hear that, Nicole. :( I hope you can find a solution. Have you seen a doctor? Were they helpful at all? After one week of being gluten-free, nothing's changed. I'll keep going, though! Maybe it takes a while. Hi Erin!! Wow, these look SO good! 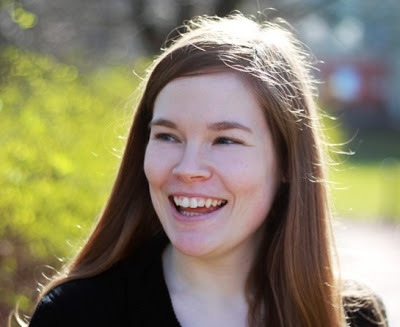 Incredibly soft and chewy – I can tell from the pictures! Are these the ones you adapted from my site? OR are those yet to come! Regardless, they look AMAZING and I think I need to try them! What?! Nooo. I would of course credit you! :) Yours are still to come. I'm not wild about the pictures so I'm waiting until I can eat gluten again because Mr. Texanerin hates all Christmas gingery stuff, meaning there's nobody to eat them. I also have grain-free gingerbread men to post. So um, yeah, people. Hope you like ginger cookies because two more versions are coming! And I hope you do try them. So yummy! Good luck with your gluten free month, I hope you see some improvement! I love these cookies, I can definitely see these making it onto my christmas baking list! They look so good! I made some no-bake cookies like this years ago, raw, vegan, GF – I need to go look up my own recipe because I forgot about them. Yours look PERFECT with that drizzle on top! Mmm, great flavors! Thank you, Averie. :) I'll have to go check yours out! They sound delicious. Let me know how your gluten free diet turns out for you! Yeah, but for Thanksgiving you get enough calories anyway, so I thought I'd be bad to add to it. I mean, there were 4 ounces of cream cheese per person in there. BAD! Bad bad bad girl. Anyway, I'll let you know how the gluten-free thing goes! Oh I really hope you're gluten freeness works! Those cookies sound delicious! I love the addition of spices! Ive got one can of pumpkin purée I need to use before the end if the month before I start working on Christmas desserts. These cookies look really delicious. I hopefully you'll start feeling better after going gluten free for a week. Thank you! I hope it does. But I kind of hope it doesn't because I don't want to have a gluten intolerance. I want there to be some simple, non-serious cause / treatment to all my symptoms. But yeah, guessing that won't happen! Good on you for trying the gluten free option, Erin. I really wouldn't be surprised if you saw some great improvement in the way you feel.